Beef, fleeting paranoia, the desire to win big and be No. 1 — we talking NBA, or hip-hop? When Kendrick Lamar unveiled his already hyperanalyzed new record last week, it seemed as if everyone had a reaction — including two of the NBA’s leading MVP candidates. But we’ll get to that in a second. Much of the talk surrounding Lamar’s new “The Heart Part 4” — a first glimpse of the Compton, California, native’s new album, set to drop April 7 — centers squarely on the second verse. Lamar is obviously referencing a peer. The bars could be about Big Sean, who allegedly took aim at him earlier this year on “No More Interviews” — And I’m just not impressed by you n—-s rapping fast / Who sound like one big asthma attack … Who you put in your top five and claim they the savior of rap. Lamar’s new lines can also be perceived as a direct warning to Drake. The two Grammy winners are considered leaders of their musical generation. Drake’s ambidextrous rapping and singing style has made him an international superstar and given him the power to command $20 million from Apple for streaming exclusivity on a single project. Lamar is a critic’s darling with a legion of fans (including former President Barack Obama) who adore his artistry and consider him a throwback to hip-hop’s finest wordsmiths. And despite collaborating on two hit records — 2012’s Janet Jackson-inspired “Poetic Justice” and A$AP Rocky’s raucous 2013 “F—–‘ Problems,” Drake and Lamar have seemingly engaged in a subliminal cold war for the past several years. It seems to have picked up where they left off over the last week with their high-profile respective releases. Rap, like basketball, is a blood sport. There’s room for cordiality, but at the end of the day there can only be one. Drake vs. Kendrick is the Kobe vs. LeBron of rap: Titans who live in each other’s presence, but never met face to face to determine the game’s single leader (though Drake dubbed himself just that on 2010’s “9 A.M. In Dallas”). Black male competition is a foundation of rap, and is in large part why the majority-black NBA is its most direct creative comparison. And no narrative has dominated recent league headlines quite like the long tail of Russell Westbrook and Kevin Durant’s ugly divorce. Both of whom make appearances (of a sort) on Drake and Lamar’s new releases. Drake’s More Life, by the way, just went to No. 1 on Billboard’s album chart, and he broke the first-week streaming record he set with last year’s Views. Drake pays homage to Durant on the playlist’s intro “Free Smoke” when he raps, Mama never used to cook much / Used to chef KD / Now me and Chef, KD / Bet on shots for 20 Gs. Then, on “Can’t Have Everything,” he calls to name Westbrook: Same n—- beakin’ always duckin’ my release date / That’s when the phone starts ringin’, like, ‘Are we straight?’ Two-faced n—- back around with the three-face / Damn, ol’ triple-double, Russ face. Drake vs. Kendrick is the Kobe vs. LeBron of rap. But it’s Lamar’s mention of the recent Serge Ibaka-Robin Lopez scuffle in “The Heart Part 4,” and his take on the Westbrook-Durant drama overall that is catching the attention of Westbrook, himself, in particular. Lamar inserted himself into a story that has been dissected to nauseating levels and has given it, for lack of a better phrase, “more life.” Tables turned, lesson learned, my best look / You jumped sides on me, now you ’bout to meet Westbrook / Go celebrate with your team and let victory vouch you / Just know, the next game played I might slap the s— out you. 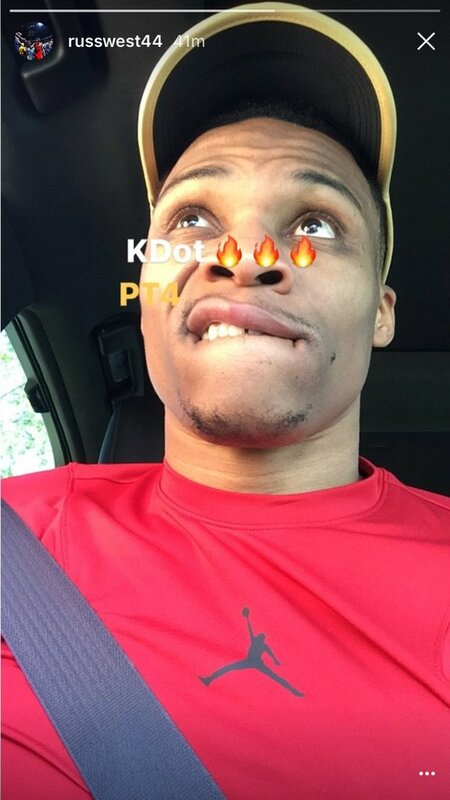 Westbrook co-signed the record on social media. His smile, smirk and praise seem to indicate that Lamar is saying something that Westbrook can’t. Westbrook isn’t the only All-Star and MVP candidate vibing out to Lamar — LeBron James is, as well. The three-time Finals MVP is the league’s hip-hop gatekeeper, as well. His Instagram stories have become a platform for his unofficial listening sessions for artists such as Jay Z, OutKast, Big Sean, Rick Ross and Spice 1. Over the weekend, James took to IG with Lamar’s “The Heart Part 4” as his soundtrack. And as far back as Feb. 23, 2016, following Lamar’s electric Grammys performance, James took to Twitter to request that Lamar release more unreleased records. untitled unmastered — a compilation of the kinds of songs James mentioned — was released on March 4, 2016. James is one of the most referenced athletes in rap songs ever. He even went on tour with Jay Z less than a month after being drafted. And in 2017 alone, James’ stamp on hip-hop is gargantuan — and hilarious. Shortly following Future’s recent back-to-back No. 1 albums, James, in a do-rag with the cape flapping in the wind, filmed himself eating in his driveway, drinking Rosé and listening to “Mask Off,” the Atlanta MC’s newest hit. James ended up missing, due to illness, the next night’s prime-time showdown against the Chicago Bulls. It’s more comical, though, to think James may have been nursing a Future hangover. It happens. There’s room for cordiality, but rap, like basketball, is a blood sport. And, at the end of the day, there can only be one No. 1. And rap, like basketball, is a game nuanced by pettiness (and no one does petty in the NBA quite like unanimous First-Team All Petty combo guards Westbrook and James). All of this points to the larger marriage of the two mediums. Whether it’s internal beef, the fleeting paranoia of jealousy, the fight to craft legacies on their own terms, or the obsessive desire to be king of the hill, the lines between basketball and rap have become less and less distinguishable. Damn, I swear sports and music are so synonymous, Drake noted on 2010’s “Thank Me Now.” Because we wanna be them / And they wanna be us. Point out the lie.